The earliest verifiable recorded history of Batsford Park, of which Batsford Arboretum forms the central part, dates back to the Freeman family who owned the estate in the early part of the 17th Century. As from Easter 2011 we will have new garden centre shop, plant area and Garden Terrace Restaurant. From August 2011 new gift shop and visitor centre and extra 5 acres of newly planted arboretum. We know that a substantial house existed on the site which was altered and extended over a period of some 200 years. The gardens were extensive and originally formal in their layout, evolving into a more relaxed theme in the late 19th century. The stature and backbone of Batsford Arboretum which we see today was no more than a dream when its creator inherited the Batsford Estates from John Freeman-Mitford in 1886. During the 1860s Algernon Bertram Freeman-Mitford (later 1st Lord Redesdale) travelled widely in oriental Asia as an attaché to the foreign legation. He was deeply influenced by the landscapes in China and Japan and became fascinated by those plants that he found there, especially the bamboos. Most of the major trees, many of which are most unusual, were his original plantings. He also created one of the foremost bamboo collections of the time and some of these still live on today. The estate was sold in 1919 to Gilbert Alan Hamilton Wills, later the 1st Lord Dulverton. His wife, Victoria, took a great interest in the gardens making many additions to its plant stock. Quite a number of the larger specimens were planted during this time, including the Handkerchief tree and some fine Copper Beeches. During the war years and for some time after 1945, the wild gardens were neglected and became somewhat overgrown. Frederick Anthony Hamilton Wills succeeded his father as the 2nd Lord Dulverton in 1956. Fortunately he had a great passion for trees and together with Mr. Ken Hope, his head forester, he proceeded throughout the 1960s to halt the decline. With great vigour and enthusiasm he consolidated the existing collections as well as adding a multitude of other trees to Batsford. He was single-handedly responsible for raising the status of Batsford to an arboretum of international standing. In 1984 Batsford Park was donated to a charitable trust founded by the 2nd Lord Dulverton to ensure the future of the arboretum. The 2nd Lord Dulverton died in 1992 and the Batsford Arboretum continues to be administered by the Batsford Foundation who continue to develop the arboretum as a place of great beauty to enjoy as an educational resource. 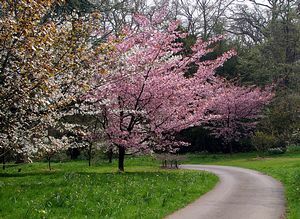 In 2002 the Arboretum was recognised by the N.C.C.P.G as holding the national collection of Japanese Flowering Cherries. M40 from North: Leave at junc 15. Follow A429 to Moreton-in-Marsh. Turn right at 2nd mini roundabout onto A44 signed Evesham. 1 mile on the right. M40 from South: Leave at junc 8 Follow A40 round Oxford then join A44 to Moreton-in-Marsh. Follow A44 through Moreton towards Evesham.1 mile outside Moreton on right hand side of A44. M5 from North: Leave at junc 6. Follow A44 in Evesham direction. Up Cotswold escarpment, through Bourton-on-the-Hill. At bottom of hill see banners on left. M5 from South: Leave at junc 9. Follow A46 signed Evesham. Take A44 signed Oxford. Up onto Cotswold escarpment, through Bourton-on-the-Hill. At the bottom of the hill see banners on the left.